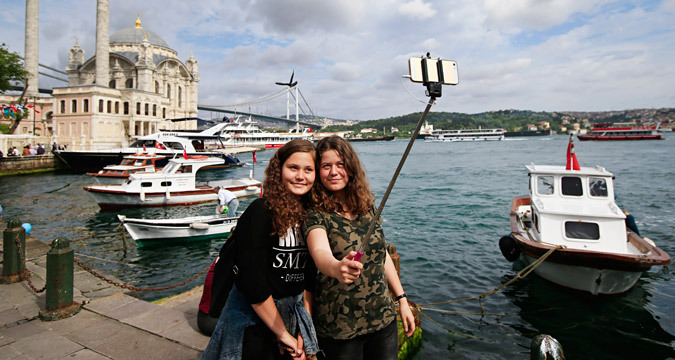 Tourists at the Ortakoy square in Istanbul. RBTH presents a selection of views from leading Russian media on international events, featuring reports on CIA revelations of planned terror attacks against Russian citizens in Turkey, plans by ISIS to produce chemical weapons, and the introduction of free Wi-Fi in three Moscow cemeteries. The CIA has shared data with the Turkish security services, suggesting that terrorist attacks were being prepared against tourists from Russia in the country, reports the business daily RBK, citing the Turkish media. According to Haberturk, Turkey's Interior Ministry issued a warning based on the CIA’s report to 81 provinces. The US intelligence agency believes that three Palestinians and another suicide bomber belonging to the Islamic State group are preparing attacks against Russian tourists in Turkey. Haberturk calls the names of the alleged Palestinian terrorists – Mumtaz Muhammed Jamas Dagmash, Ayman Ahmet Abdullah Nofal and Rafet Abbas. According to the CIA, the Palestinians may be implicated in the Oct. 31terrorist attack, which killed 224 people on board the crashed Russian Airbus A321. Terrorist Abu Khalid, also known as Jamal Nasa, who is linked with the Islamic State group banned in Russia, is presently in Turkey. According to the data of the US intelligence, cited by the Turkish media outlet, Abu Khalid got in touch in Turkey with a certain man who was planning a terrorist attack. After the Turkish air force shot down the Russian Su-24 bomber on the Turkish-Syrian border, Russia imposed sanctions against Turkey, including the prohibition to tour operators and travel agents against selling trips to Turkey. As Russian Prime Minister Dmitry Medvedev stated on Dec. 9, the decision to close resorts in Egypt and Turkey for the Russians is not the "machinations of the government, not the ill will of the authorities, it is the question of the safety of our citizens." the tabloid daily Komsomolskaya Pravda. Wi-Fi will be available in the open areas of the Vagankovskoye, Novodevichye and Troyekurovskoye cemeteries. "Free internet access will make visiting cemeteries easier and will also have an educational aspect," said Artyom Yekimov, head of the state-owned funeral service Ritual. "Wi-Fi at the cemetery will be helpful for visitors. Everyone interested in a buried person or a monument at his or her grave will be able to get the necessary information online. In addition, the internet will enable you to download a map of the cemetery." A tender to select a provider will be announced in the near future. The Islamic State (ISIS) jihadist organization may use chemical, biological weapons or a dirty nuclear bomb in Europe, recruiting scientists from around the world, the news website Gazeta.ru reports. This is stated in a recent report by the European Parliament, authored by political analyst Beatrix Immenkamp. Shortly after the terrorist attacks in Paris on Nov. 13, French Prime Minister Manuel Valls warned that Europe faces a real risk of being attacked by terrorists using chemical or biological weapons. Many experts argued previously that the terrorists' next weapon could be a dirty bomb – an explosive device containing chemical or radioactive substances. ISIS used rudimentary chemical-warfare shells to attack Kurdish positions in Iraq and Syria at least three times in June and July 2015. “[ISIS] has recruited and continues to recruit hundreds of foreign fighters, including some with degrees in physics, chemistry, and computer science, who experts believe have the ability to manufacture lethal weapons from raw substances,” says the European Parliament report. According to the experts, in Syria, some chemical weapons material, including traces of sarin-type chemical weapons and ricin-type biological weapons, appears to still be in the country and potentially accessible to the terrorists. In Iraq, the group had access in 2014 to bunkers with mustard agents used by Saddam Hussein’s regime. In July 2014, the International Atomic Energy Agency revealed that ISIS had seized nuclear material from Mosul University in northern Iraq. In August 2014, a laptop owned by a Tunisian physics and chemistry graduate fighting with ISIS in Syria was found to contain a 19-page document on how to develop bubonic plague from infected animals and turn it into a weapon. Following its expansion into Libya, ISIS may also have access to chemical materials from the overthrown regime’s storage facilities.